An article from the Wellington Evening Post (New Zealand) Monday May 30th 7th 1955. TEDDY BOYS - the real thing- who visited "The Post" to demonstrate the authentic version of this youthful London craze. David Kelly (left) is in "Mississippi gambler style" Tony Griffith (middle) is true to the trend though in no particular style, and Ronald Bunting is in exact replica of Edwardian Fashion. RIGHT. - a rear view of the trio. THREE Teddy Boys resplendent in their fancy clothes, and accompanied by a young and attractive blonde, came into the "Evening Post" to correct some of the impressions they thought might have been made by the story which appeared the other day on Teddy Boys. The story they referred to was about Wellington's "23 known Teddy Boys," how some carried sharpened bicycle chains, some knives, how they wore such clothes as stove-pipe tweeds and coats with big lapels. The point they particularly wanted to make was that they had never carried a knife nor a bicycle chain, that only a bad element among Teddy Boys did and that they, personally, never looked for trouble, but only refused to avoid it. They introduced themselves as David Kelly, Tony Griffiths and Ronald Bunting, all 18 years of age, all Stewards on the Dominion Monarch and only temporary away from their home town of London. This brought up the second point they wanted to make. The Teddy Boys here in Wellington they said, are not really Teddy Boys. They are only inferior imitations. They don't dress as well. Dress apparently is THE thing, as far as Teddy Boys are concerned. "We wear drain-pipe trousers and long coats with trimmings, the material gabardine and barathea - not tweed" said David Kelly. He explained that his costume was the Mississippi gambler type, Ronald's a true replica of the Edwardian style, and Tony's rather a mixture of different styles. "Wearing these clothes in London doesn't cause a second glance," said David. "There are many thousands of us there and the people are used to us. But here is different." What the craze amounted to, he said was nothing more than youthful fun. Teddy Boys were never much older than 22- they grew out of it before then. But while they were young they liked to experiment with clothes. When other people laughed, however, trouble was likely to result. "We don't pick fights but we stick up for ourselves" said David. "It's the few bad ones who give us a bad reputation," said Ronald Bunting. "We three for example, have never carried a knife, razor blade or bicycle chain." "The most I've ever carried is a glove," said David "I took that along to a dance the other night when I heard there might be trouble." 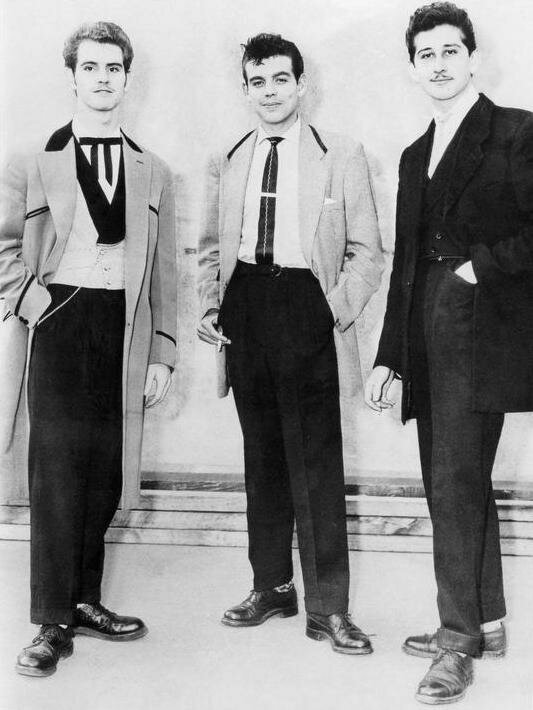 The suggestion that some girls seemed particularly keen on Teddy Boys because of their fancy clothes was agreed to by the three youths. But their blonde companion, who was staying out of the interview, interposed that she did not particularly like the clothes. "These clothes were good enough for our Grandfathers" said Ronald, though not with great seriousness. He had four different costumes, all tailor made in London and would be wearing them at every opportunity. One place where there is no opportunity is aboard the Dominion Monarch. The clothes are not approved there, not even by some of the other crew members, they said. But Teddy Boys on the ship did amount to a sizable number of 25. With such influence on Wellington from overseas there was a likelihood of the fashion taking hold here properly, they thought. Nobody should object to a brightening of clothes in Wellington. But at the moment, the average Kiwi did seem to reject the idea violently.